If you are a home delivery subscriber of The Times, you will continue to have full and free access to our news, information, opinion and other features on your computer, smartphone and tablet. International Herald Tribune subscribers will also receive free access to NYTimes.com. If you are not a home delivery subscriber, you will have free access to 20 articles (including slide shows, videos and other features) each month. If you exceed that limit, you will be asked to become a digital subscriber. On our smartphone and tablet apps, the Top News section will remain free of charge. For access to the other sections within the apps, we will ask you to become a digital subscriber. • Readers who come to Times articles through links from search engines, blogs and social media will be able to read those articles, even if they have reached their monthly reading limit. This allows new and casual readers to continue to discover our content on the open Web. On all major search engines, users will have a daily limit on free links to Times articles. This is because the New York Times sells advertising on its web pages, and if people can’t link through to their articles, then they can’t charge as much for their advertising. And since the vast majority of people who read the news online link to individual articles, either through social media sites, news aggregators or search engine results (as opposed to clicking on every article on the Times’ homepage like it were a physical newspaper), preventing users from reading NYTimes articles when they click on those links would drastically reduce the articles’ pageviews. Go to the New York Times website. Select the title of the article and copy it into your computer’s (tablet’s?) clipboard. Go to your favorite search engine – let’s say Google, for this example. If you reach the daily limit (unspecified on the NYTimes’ site) for the search engine, just use another search engine. Can it be as simple as removing the “?hp” from the URL to get to the article in the first place? I doubt it, but since I haven’t passed my monthly limit on NYTimes articles this month yet, I can’t test it. If anyone out there can confirm or deny this, post it in the comments of this post, OK? Also, the NYTimes’ FAQ site for digital subscriptions boasts that if you read the same article twice in a given month, it won’t count against your limit of twenty. That would suggest that the NYTimes is tracking your individual reading habits, so it knows which articles you’ve read on a monthly basis. This is probably not a new practice, and is probably not used for anything other than enforcing their subscription rules, but given how sensitive the NYTimes is about topics like online privacy, I’m surprised they buried this information so deep in their FAQ file. Anyway, I hope this little tutorial helps you to continue enjoying NYTimes content, right up until the point where their desperate attempts to cling to the old world of “news via subscription” ends with their dramatic and ultimate demise. The CEO of the Tribune Company has posted a list of 119 broadcast news cliches that he doesn’t want his anchors or reporters to use anymore on the air. Journalism is Dead! Long Live Journalism! Two weeks ago, I got on a 7:45AM New Jersey Transit to New York City. Just then, power problems developed in the tunnel under the Hudson River, causing massive delays throughout the NJTransit system. Four hours later, when it became obvious that I was still at least an hour away from getting to my office, I gave up and came home. During the entire ordeal, the train conductors kept apologizing for the inconvenience while assuring us that they would pass on any new information as soon as they received it. Meanwhile, the passengers were on their blackberries, iPhones, and other mobile devices, receiving status updates from various websites, Twitter feeds, Facebook posts, and even NJTransit itself. Those who were disconnected were treated to a steady stream of information as passengers called out the latest updates to each other and recommended courses of action for folks with various intended destinations. At the time, we joked that the train conductor should get himself an iPhone so he could tell us more than what NJTransit was telling him. Last week, I dropped a friend off at Continental Airlines’ Terminal C in Newark Liberty Airport about an hour before someone walked the wrong way through a security checkpoint, causing officials to evacuate the terminal. About 10,000 people crammed the check-in counters and baggage claim areas, waiting for the go-ahead to re-enter the terminal and get on their delayed (possibly even cancelled) flights. My friend gave interviews to Fox News and The Star Ledger, and even received update requests from a CNN reporter who had found his Twitter feed. As with the train delay above, no one at Newark Airport or Continental Airlines was making any announcements or providing the inconvenienced passengers with any further information. The two incidents raise the following question in my mind: has information dissemination, particularly in the case of breaking news, broken down completely, or has it changed in a way that renders the old methods obsolete and unnecessary? Certainly, both NJTransit and Continental Airlines could have made repeated announcements over their public address systems and placed public relations people in the terminals to talk to passengers and the media, but these actions would likely have yielded repetitive and less accurate information than what the passengers were finding on their own. Which is worse? Not saying anything or repeating an unhelpful message over and over again? Perhaps we’ve reached a point where these organizations realize that the passengers are informing themselves and have chosen not to bother competing? “Crowdsourcing,” like most everything else on the Internet, will really only get big when it gets small. Wikipedia became the gold standard for research by using the whole planet to (attempt to) catalog all of the world’s knowledge. Now, we’re creating mini-wikipedias for specific events, like a security concern at an airport terminal. Given time, familiarity, and a build-up of trust, this model could eventually out-pace the concept of “breaking news” from the larger news sources. It was maybe a little too far. I think in hindsight I look back on it and I go, “OK, maybe that wasn’t the best first impression to make again, the first second impression.” I mean, I had fun up there, I had a good time, my dancers had fun and the band had fun. I respect people and feel like people walked away from that feeling disrespected. I would never intend to disrespect anybody. So that was not my intention. What he needs now is a musical “reset” – another spotlight moment, like the AMA’s, in which he knocks everyone’s socks off musically, and convinces people that music is his thing, not social commentary. [N]o matter how intense curiosity about public figures can be, there is an important and deep principle at stake which is the right to some simple, human measure of privacy. I realize there are some who don’t share my view on that. But for me, the virtue of privacy is one that must be protected in matters that are intimate and within one’s own family. Personal sins should not require press releases and problems within a family shouldn’t have to mean public confessions. I wish every celebrity in the world would memorize these two paragraphs and recite them whenever some nosy reporter presumes to suggest that his/her private life is somehow my business. Tiger had a car accident and knocked over a fire hydrant. He needs to explain that to the police, and hence, to the public. 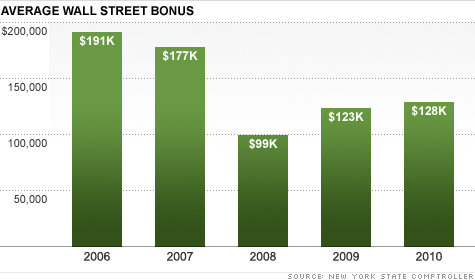 If someone were knocking over fire hydrants in my neighborhood, I’d want to know who, where and why. That’s a public safety issue and a law enforcement issue. However, if the answer to “Why?” is “domestic dispute” or “private matter,” then I have no need or desire to know more. Michaele and Tareq Salahi are the latest in a series of Reality TV inspired stupidity. Years ago, people would do dumb things to get noticed, to be sure, but the result was rarely more than the standard fifteen minutes of fame. Today, with the institutional backing (and financing) of a Reality TV Show’s production company, exhibitionists like these have the capability of distracting the entire nation for fifteen days, not fifteen minutes. The Salahi’s, like the Balloon Boy family before them, only benefit from their actions if they get caught. And even though the news media knows this, they play right into the perpetrators’ hands, because they also know that it sells soap. My only hope is that the largely negative reaction to both the Salahi’s and the Heene’s dissuade Reality TV producers from pulling stunts like this in the future. Because the media is certainly not going to show any restraint. Brandon (age 6), before the speech: The President is speaking at 12 noon? What about kids on the west coast? Will they still be asleep? Brandon, after the speech: If the President asks for help all the time, then we can too. Avery (age 9), after the speech: If the kids with all those challenges accomplished their goals, then we should accomplish our goals more easily than them. Not easily, but more easily. Avery, when asked if Barack Obama should visit his elementary school one day: I’d rather he wait until next year and visit our middle school, because when you’re the youngest in the school, you get to sit closest to the stage during an assembly, and then I’d be the first one to shake his hand when the speech is over. If he visited our elementary school this year, I’d be way in the back. 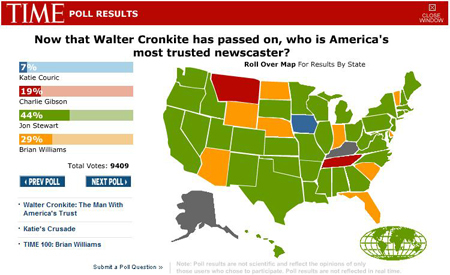 Time Magazine Poll: Now that Walter Cronkite has passed on, who is America’s most trusted newscaster? From which we learn: The most trustworthy man is the man who tells us upfront that he’s lying to us. Sarah Palin: Crazy as a Clinton? Like many Americans, I was confused about Alaska Governor Sarah Palin’s sudden resignation last week. Turning to the Internet, my usually dependable series of newsfeeds did little to clarify my confusion. Almost no one linked to the actual statement that she made, choosing instead to quote portions of it, and then use some decidedly subjective terms to describe it. CNN called it “rambling [and ] often-disjointed.” US News & World Report called it “rambling, quirky and quixotic.” And the New York Times went with “breathless.” These are not the kinds of words I’m used to reading in news articles (as opposed to Op-Ed pieces or blog entries). I don’t often spot celebrities on the streets of Manhattan, usually because I’m too oblivious to notice them as I walk right past them. 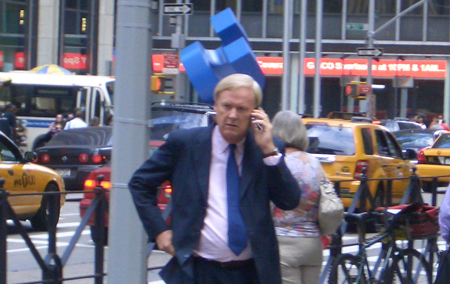 But today, on my way to New York’s Penn Station, I looked to my left and there was Chris Matthews talking on his cellphone. This is why I finally threw a digital camera in my laptop bag (hat tip: Ilya Burlak).